ConvertPlug is a premium WordPress plugin primarily used to collect emails from visitors and build a mailing list. In addition the plugin also offers additional features for promoting content through top sticky bar and slide in panels at the corner. In this article let us take a deep look into the features and pricing of this ConvertPlug WordPress plugin. The plugin is developed by Brainstorm Force and can only be purchased from envanto marketplace. It will cost you $21 and needs to be purchased through codecanyon, which is a segment of envanto marketplace. It has been sold to more than 5000 customers with almost 5 star rating. Plugin zip file with installation license on single site. All future updates for lifetime and the plugin can be updated directly from WordPress admin panel. 6 months of free support and get additional 6 months for $10.63. This is a very nominal onetime price compared to other popular popup plugins. For example, OptinMonster one of the popular plugins will cost $9 per month to get start with the minimum features. Compared to this, ConvertPlug is far better offering complete functionalities for onetime payment of $21. Once the plugin is purchased from codecanyon, download all files and documentation. Go to your WordPress admin panel and navigate to “Plugins > Add New > Upload Plugin”. Upload only the “convertplug.zip” file and install the plugin. If you want to install through FTP then extract the “convertplug.zip” file and upload the extracted content under “/wp-content/plugins” folder through FTP. Once installed and activated successfully, you will see a new menu item named “ConvertPlug” in admin panel. First thing is to register the plugin using the purchase code available with the downloaded documents. Go to the “ConvertPlug > Dashboard > Register” menu and register by validating your purchase. After successful registration, you should see the purchase verified information under “Dashboard > Brainstorm”. Whenever a new version is released, the plugin can be updated directly from WordPress admin panel without the need of going back to codecanyon. 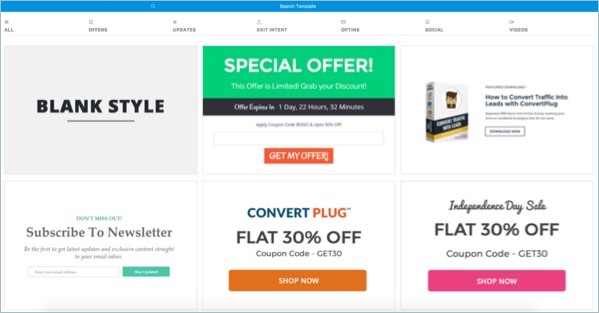 ConvertPlug is an all in one plugin to collect email ids, promote content and offer coupons. You can even show social icons in the popup to promote content sharing. Basically uses three modules – modal popup, slide in and info bar to trigger the required action. Collect email from users to build email list. You can integrate the email collection with popular email marketing services like MailChimp, Aweber and Constant Contact. Can be integrated with other popular services like WooCommerce checkout form, WordPress comment form, WordPress registration form and Contact Form 7. Plugin will detect inactivity, exit intent to display the popup. Also you can trigger on entry as a welcome message, after certain time and when user scrolls to a certain position. Modal popup can be shown full screen, inline or in widget area. Various positions for popup are available like before or after post content, inline, shortcode embed and launch on click. Hundreds of readymade templates will make your work easy. You can also design your own template using the plugin editor. 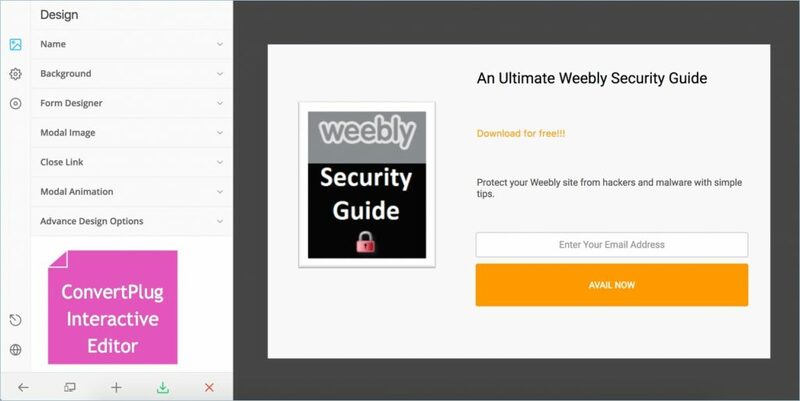 Promote videos in a popup. Popups can be added on individual pages or on the complete site. This gives possibility of adding different setup for different pages on your site based on need. Analytics of each popup can be tracked within your WordPress dashboard. The plugin offers three modules, which can be enabled or disabled under “ConvertPlug > Dashboard > Modules” section. Click on the “Advanced Settings” button to setup like who can see the plugin dashboard, double opt-in, timezone and other parameters. Modal Popup – this is the typical popup window you will be seeing on most of the sites. It is generally triggered with user inactivity or when user tries to close the browser tab. Slide In – it is a small box will slide out from the side. Generally used for content recommendation and social sharing. Info Bar – this is a sticky bar on top or bottom of the site. Generally used for collecting emails for sending newsletter or for offering special coupons. Analytics every single modal popup / slide in / info bar can be viewed within WordPress dashboard in an attractive graph. You can easily do A/B testing to find which variant of the popup is performing better on your site to get more subscribers. ConvertPlug offers a built-in editor to create and customize modal popups, slide ins and info bars. The editor has three major sections – design, behavior and submission. Under design section, you can focus on providing details like name, set background colors, design form layouts, set animation effects, etc. Behavior section has options to define the launching option, set target pages and choosing devices to hide. Submission section allows you to assign the campaign and set action to be executed after form submission. The editor works interactively, when you select any element on the preview window, you will be taken to that settings automatically. This will make your work easy by choosing one of the existing templates and customize it according to your need. There are hundreds of templates available for free. We are sure one of the default templates should be sufficient for any type of users. Some of them are part of the plugin and some needs to be imported from the developer side. You can view the live preview of the template before choosing and customize it later to adjust the look for your site. Templates are also classified for different categories like offer, exit intent, video, social, updates and optins to choose the suitable one for your need. If you don’t like the templates, simply create a new one by choosing on the “Blank Style” template. The plugin is integrated with popular email marketing services and other contact form plugins. You should install the relevant addon from the “ConvertPlug > Addon” menu for integrating with that service. Once the addon is installed then create a campaign under “ConvertPlug > Connects” menu. For example, if you want to connect to Aweber then install the Aweber addon. You should enter the API key from Aweber and connect the plugin to your Aweber account. Finally assign one of the campaigns when creating modal popup or slide in or info bar. This will help to collect the email from user and directly send to Aweber. You can manage all the subscribers under your Aweber account. The purchase includes six months of free support and further support can be extended on paid basis from your codecanyon account. You will get decent support within few days for your tickets. The knowledge base can be accessed from the WordPress admin panel under “ConvertPlug > Knowledge Base” menu (you will be taken to the Brainstorm Force site). Raise the ticket from the menu “Dashboard > Brainstorm > Help > Request Support”. You should create a separate account with the developer to submit a ticket. View all live demos on the developer’s site. View customer comments, ratings and reviews on codecanyon. You will feel good opinion about the plugin after reading all reviews and comments. ConvertPlug is definitely worth for the money you pay for. It makes your email building and promotion work simple and efficient. We highly recommend giving it a try on your WordPress site.